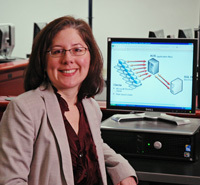 Shelly Lukon IT project manager at the University of Pittsburgh’s Computing Services Systems Development department, found a career that let her combine her love of math and computers. And when she decided to ramp up her skills with a second master’s degree, choosing Duquesne University and its Computational Mathematics program was a no-brainer. As a chemist at U.S. Steel, Lukon would often use computers to aid in her analysis and found her interest in the field growing. She completed a master’s degree in Information Science at the University of Pittsburgh and became a computer programmer. “It was a natural transition for me,” said Lukon. “The next thing I did was become a systems analyst, analyzing code to find problems within the system,” said Lukon. From there, she segued to consultant, where she became firmly entrenched in project management. “I’ve worked for a financial company, some industrial manufacturing companies, and now I’m in an academic institution doing IT project management,” she said. Among Lukon’s proudest accomplishments are teaching at the college level (she was a part-time instructor at Duquesne for two years) and being part of a team that was awarded a federal grant to continue the research she began with her master’s thesis. Lukon is working alongside Dr. Patrick Juola, her advisor at Duquesne, to develop a machine-aided, back-of-the-book indexing system. “Typically, a human indexer scans through books to identify key words, and then arranges them in a hierarchy with page numbers and references at the back of the book,” said Lukon. “It’s a very time-consuming process. We’ve come up with algorithms that take the words and assign mathematical values that tell how related some words are to others. By using this mathematical information, you could actually come up with an index that would be fairly close to what a person would do by hand, but would save them a lot of time.” The group plans on marketing the product to publishing companies down the line.